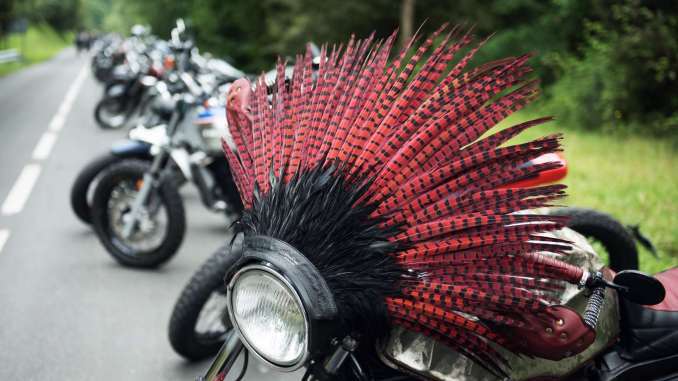 Wheels & Waves, the biggest festival dedicated to the world of bike customisation, is not confined to Biarritz, with its perfect surfing beaches and romantic neighbourhoods. About a 40 minute ride away, just across the border, in Spanish territory, San Sebastian (a city often referred to as “posh”) is a second hub for those who are passionate about biking, and the location for the races. In fact, if Biarritz is the place to show off, San Sebastian is where you need to prove you have what it takes. Right outside of town, we find El Rollo a flat-track race that already hosted a meet the first day of the festival. And a Moto Guzzi bike came in second. But we came to San Sebastian on 16 June for another, equally exciting event: the short uphill races (the so-called “shots”), hosted at Jaizkibel, not far from San Sebastian but… much higher up, on the summit of a mountain that has been dubbed Punk’s Peak for the event. Why “Punk’s Peak”, you might ask? We’ll explain later. For now, let’s enjoy the ride. Naturally, we’re not the only ones on the road: there are bikers everywhere, some alone, others in groups, some cruising calmly and enjoying the landscape while others zip past us at full speed. Not far across the border the road begins to move upwards with curves immersed in nature: a biker’s paradise. From time to time you can catch a glimpse of San Sebastian through the vegetation, and of the narrow strip of ocean that reaches the city. The sky is overcast today and it’s raining a little, but the view is still breathtaking. Suddenly, however the road is cut off by signs and staff for Wheels & Waves. We can’t go further. Have we arrived? Not quite. We need to get off our bikes and begin the real climb. Only motorcycles were allowed further up than the last parking lot, and only until 11.00 am. It’s now almost 12 noon so we’ll have to get to Punk’s Peak on foot. Better that way though: the entire 3 km from where we started was lined with motorbikes. Some are noteworthy, and several customised Moto Guzzi bikes stand out. For example, there’s a wicked military green side-car based on a period V7 (’70s? maybe even late ’60s? ), decorated with a dragon on the front mudguard and equipped with every accessory for a long trip. This bike has visibly done some travelling, but it’s in great shape, ready for another trip. The rider must be good with bikes, because he knows how to care for his beloved. A little further forward there’s a very different bike: a Guzzi Le Mans 3 from the early ’80s with several personal touches, including the seat, which was clearly tailor made. Beautiful! When the owners come pick their bikes up after the race, they’ll find a little surprise: we left our business card to invite them to our official stand at the Biarritz Village so they can share the story behind their bike and their passion for Guzzi. As we keep going, besides Guzzi bikes there are naturally hundreds of customised jewels representing every brand and time period: a goldmine of ideas, creativity and thoughtful engineering. After the final bend, we’re at the starting line, Punk’s Peak. Now’s the time to tell the story behind the name: it’s a tribute to “Pike’s Peak”, the most famous (and respected) uphill race in America. However, this is an irreverent tribute, that nods to the great American model while defending it’s own identity with pride: this is a track for rebels, the “punks” on wheels, the ”who cares about tradition and what others think, we race our way” sort. Even at the summit, the weather is less than ideal, but in some ways the mist that blankets these mountains is part of the ambience. Not far from here, and not at all frightened by the noisy bikes, several horses and ponies roam free. Though the green grass is quite humid, the Wheels & Waves crowd is unaffected: several people are stretched out on the grass for an improvised pic nic, at least until the “shots” begin. At that point, everyone tries to find a spot along the railings to see the bikes start, cheer and get a photo of the best and most creative rider. followed by the next two. The performance is dubious, but the fun is guaranteed. Next comes a parade of real punks, and things gradually get more serious: higher engine capacity, higher speeds, and the desire to come in first. Without, of course, breaking with the spirit of an unforgettable festival. A tough-looking Moto Guzzi participates in one of the final rounds. It starts out on the right hand side of the road. The bike has a solid chance at winning, unfortunately though it skids to the side right at the start, perhaps due to the wet road, and for a moment it seems as though the rider might fall, no, he regains his balance and shoots up, but his adversary has already earned a solid advantage. Regrets? Let’s not be foolish, they’re the only thing forbidden here at Punk’s Peak.